This escorted gay group trip will allow you to safely see all the incredible sights of Imperial Russia. Including stays in both Moscow and St Petersburg, you’ll experience The Kremlin and Red Square as well as the incredible architecture and history in St Petersburg. Upon arrival in Moscow, proceed through customs into the arrivals hall and be met by our local representative, warmly welcoming you to Russia. Transfer by private coach to the hotel where you will be assisted with check-in procedures. Tonight enjoy Welcome Dinner at Bolshoi Restaurant. After a lovely breakfast you’ll begin your tour of Russia! You’ll start off in Red Square – a popular place to visit in Moscow which separated the Kremlin from the historic quarter. Here you’ll find the famous St Basil’s Cathedral with its colourful domes and architecture as well as Lenin’s Tomb (the resting place of a former Soviet leader). 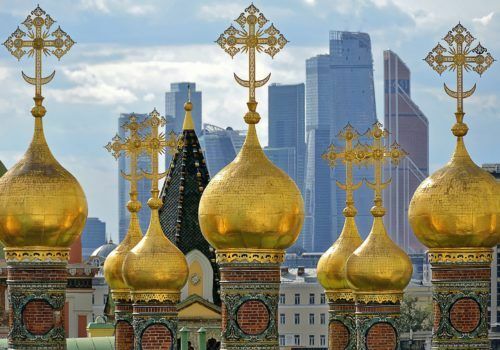 You’ll also take in other sites such as the Cathedral of Christ the Saviour and the Novodevichy convent and cemetery which is now classed as a UNESCO World Heritage Site. In the afternoon, experience taking a trip on the Moscow metro before enjoying lunch and continuing on to the Tretyakov Gallery which holds some of Russia’s most admired pieces of art. After enjoying your breakfast as a group you’ll spend today on a full day tour of the Kremlin which is considered to be one of the pivotal landmarks for key events throughout Russia’s history. You’ll take in the oldest Museum in Russia known as the State Armoury which is a treasure trove of ornate jewellery, opulent historical clothing, ancient antiques and precious artefacts. From here, you’ll make your way to the exhibition of the State Diamond Fund which contains the beautiful Russian state Jewels. Your tour of the Kremlin will also include visits to two of the most important Cathedrals in the city: Assumption (where coronations are held as well as being the burial place for religious leaders) and the Archangel (where the royals are buried). You’ll have a break for lunch before venturing 65 metres underground to the Cold War Museum where you’ll learn a lot about the military history of the country as you walk through secret tunnels. In the evening, enjoy a group dinner at Café Pushkin. Today you’ll have your morning at leisure. Take a stroll around the local area and enjoy a leisurely breakfast before you take a private transfer to the train station. From here, you’ll catch the high-speed Sapsan train to St Petersburg where you’ll be met on the other side by a tour representative. You’ll then be transferred to your hotel with the rest of the day at leisure. Today you’ll get to explore the beautiful buildings of the famous Hermitage which is the largest museum of art and culture in the world. It houses collections dating back to as far as the Stone Age acquired by Empress Catherine the Great and is sprawled across the six magnificent buildings of the Winter Palace. You’ll enjoy lunch as a group before moving onto the General Staff Building to view the famous Impressionist collection. Today you’ll be heading out of St Petersburg to the beautiful Tsar’s village which is more commonly known amongst locals the Pushkin. This stunning palace is set amongst impressive landscaped gardens and is a truly awe-inspiring. You’ll enjoy a guided tour around the ground and building taking in sights such as the Amber Room where the panels of this chamber are backed with gold leaf and mirrors. You’ll also take in the lovely Hermitage Pavillion, the lavish Alexander Palace (a former imperial palace) and the Pavlovsk Palace which is set amongst scenic parkland and greenery and has been fully restored to its former glory. After enjoying breakfast, you’ll embark on a full day driving tour of St Peterburg where you’ll get to take in all of the famous sights this thriving city has to offer such as the Nevsky Prospect, Palace Square, the Winter Palace, the Admiralty, and Vasilevsky Island. You’ll get to visit the burial place of the majority of Tsars and Tsarinas from the 18th century onwards at the Peter and Paul Fortress as well as St Isaac’s Cathedral which is visible on the skyline from almost anywhere in the city. After your day driving tour you’ll get to experience the city by canal at what is known as the ‘Venice of the North’. You’ll glide down the canals, going between the forty-two islands in the River Neva as you take in the sights. After lunch you’ll take a visit to the Yusupov Palace which is famous for being the place where Rasputin, the mad holy man who was an advisor to the last Romanov Tsar, was murdered becoming one of the most dramatic moments in all of Russia’s history. You’ll even get to visit the basement room where he met his demise. In the morning you’ll be driven to Peterhof – a palace commissioned by Peter the GReat which was the be the ‘centrepiece’ of his empire. He was inspired by the regality of the architecture in Versailles on his visit there and wanted something just as elegant and awe-inspiring. He died before it was finished as was completed when his daughter took to the throne. After this you’ll have your afternoon to do with what you wish before you reconvene as a group for the special farewell dinner where you’ll be able to share all your favourite memories of the trip with your fellow travellers. Today is the day you have to say goodbye to your new found friends. After breakfast you will be transferred to the airport ready for your departing flight home.